As vacation time is fast approaching, the ”To Do” and ”To Pack” lists continue to grow, leading to frustration and over-packing and possibly some tantrums down the road, if something important gets forgotten at home. I find that multi-tasking products work best, especially when it comes to the ”rescue remedy ” essentials and that’s why this latest launch from a lovely British organic skincare brand Purepotions is most definitely going on the road with me. Purepotions was started by Natalie Balmond, who was desperately trying to find a safe and effective way to improve her daughter Lula’s severe eczema. Anyone who has ever battled skin conditions knows how painfully uncomfortable eczema can be, particularly for a child. The probem is all encompassing, particularly in the society that we live in, which is often driven by how we look on the outside and certain stereotypes. 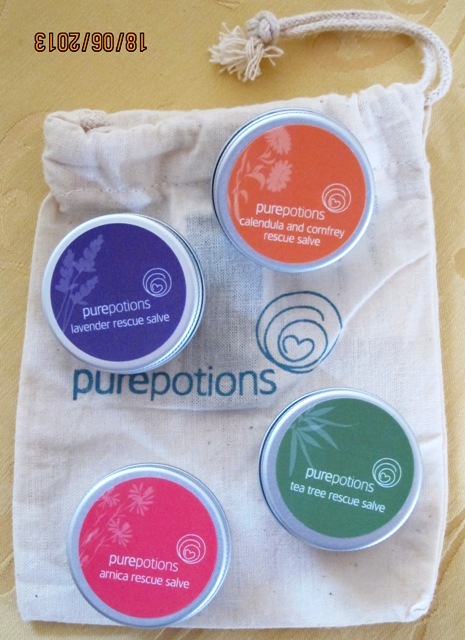 Purepotions Rescue Salves come in a little cotton string bag and contain four little pots with screw on lids ( handy if little naughty hands want to grab and open them ): Arnica ( soothing and natural ), Lavender ( relaxing ), Calendula and Comfrey ( for tissue regeneration ) and Tea tree ( cooling ). Tea Tree Rescue Salve: with heat and warmth often comes the grievances of mosquito bites-as relevant in the UK, as it is anywhere else in the world, so Tea Tree Rescue Salve comes in particularly handy to solve this problem ( in order to try to keep mosquitoes at bay I find citronella candles quite effective ). If you get bitten or stung, this remedy will cool and calm the area down. It also works well on spots, fungal infections. The actual balm feels very softening on the skin and doesn’t leave a sticky residue. I also like that it has a gentle cocoa undertone and isnt’t as strong smelling as tea tree oil in general tends to be. Ingredients: Olea Europaea ( olive ) fruit oil, Carthamus tinctorius ( safflower seed oil ), Beeswax, Metaleuca alternifolia ( tea tree oil ), Limonene ( from essential oils ). Calendula and Comfrey Rescue Salve: Calendula is known for its skin regenerating properties, so this salve is perfect for helping to heal cuts, scratches and grazes that happen to adults, as well as kids on a daily basis, whether you are at home, in the garden or out and about. Each of the salves in this kit is formulated in a base of olive fruit oil ( known for its anti-bacterial properties ), beeswax ( a natural emulsifier that acts as protective base ) and safflower seed oil ( which is wonderful for delicate and sensitive skin in particular ). Ingredients: Olea Europaea ( olive ) fruit oil, Carthamus tinctorius ( safflower seed oil ), Beeswax, Aqua ( water ), Alcohol ( in tinctures ), Calendula officianalis flower extract, Symphytum officinale ( comfrey extract ). Lavender Rescue Salve: sun protection is a must all year round, especially when it comes to delicate children’s skin-beware that sunburn in childhood is more likely to give rise to skin cancer in later years. If you do get sun burn, let this salve come to the rescue and offer your skin gentle relief. You can also use it to treat minor burns, chapped skin or dry lips. It does have a faint smell of lavender, so hopefully it will also help to relax you if you are feeling slightly uncomfortable. Ingridients: Olea europaea ( olive ) fruit oil, Carthamus tinctorius ( safflower seed oil ), Beeswax, Lavendula angustifolia ( lavender ) oil, Geraniol, Linalool, Limonene ( from essential oil ). Arnica Rescue Salve: bumps and bruises can occur when kids are learning new activities and even grown-ups aren’t immune to an occasional tumble, so this arnica salve is a perfect remedy to speed up the healing process, as long as you don’t apply it to open skin. I noticed that ‘alcohol ( from tinctures ) ‘ is listed as one of the ingredients in this salve and Natalie Balmond, the founder of Purepotions kindly explained why: ”The alcohol is only present because the tinctures are created by steeping the herbs in alcohol to infuse. It’s not added as a separate ingredient and is therefore only present in very small quantities.”. She also confirmed that all of Purepotions ingredients are bought from the UK companies but some of these ingredients are grown in Europe. Each rescue salve is handmade in the UK and has the best before date and batch number, so it is as personal as it gets-a lovely touch that shows that people who produce those salves really do care about their customers and want to make sure that their products are used correctly and safely. Ingredients: Oleo Europaea ( olive ) fruit oil, Carthamus tinctorius ( safflower seed oil ), Beeswax, Aqua ( water ), Alcohol ( from tinctures ), Arnica montana ( arnica ) extract. According to Purepotions their products are suitable for babies and children and can be safely applied to any area of the body, including the face, hands and scalp. The brand sources high quality ingredients as close to their natural state as possible and ensures they aren’t highly processed or modified. The ingredients are organic where possible and are always 100% natural. All ingredients are chosen for their skin moisturising and nourishing properties, hence no fragrances, perfumes, preservatives or petrochemicals are added into the formulations.